While you’re looking for binary options trading advice, you’ll find many people out there who advertise that you can learn to trade “automatically.” Usually this means that they want you to download or purchase a trading robot which can spot “opportunities” and place trades for you while you’re away from your computer. “It’s all automatic” is a pretty effective catchphrase in a world where people are desperate to make money and work less. I tested one of the more popular auto trading robots, you can read that review on this page. This issue is further complicated by the fact that there are people out there who make money with the help of automation. So does automated trading work or is it just a scam? 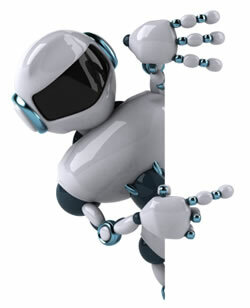 There are generally two types of automated trading. The first is fully automated robotic trading. The idea is that a computer algorithm programmed with a trading system spots setups and then initiates trades. You may or may not have control over the system parameters depending on the product. Otherwise it’s hands-off. The other type of automated trading is signal-based trading. An algorithmic program sends you trading signals (or in some cases, an actual person sends you signals—there are lots of people who provide this service) and you decide yourself whether to place a trade and execute it yourself manually. Let’s consider the obvious advantages and disadvantages given a legitimate product. One advantage is that an automated signal can probably spot more opportunities than you can, and a fully automated system could also likely manage more trades than you could. An automated system isn’t subject to the same follies of human psychology that you likely are. The disadvantages however are that you aren’t involved with your trading. If the market conditions change and the signal algorithms don’t adapt, you’ll start losing money and won’t know what’s going on unless you get involved with your trading again. You also may start to believe that you can succeed without really trying, which is a recipe for disaster in the long run. The biggest pitfall however is that most automated systems just don’t work, because the majority of them are scams, don’t work that well, or won’t work for everyone who uses them, particularly in the case of trade signals. There is no market where scammers are focused more intently right now than binary options. Binary options has the allure of simplicity and therefore there are many people who think they can make money with binary options without putting any hard work into it. These people are easy for scammers to target by offering to sell them automated trading systems. There are good signal services out there—but it’s important for you to realize that a system that works for one person may not work for another depending on the personality of whoever is applying it. There are also good automated systems out there, but they reduce your control over your trading and your involvement to the point where you will eventually pay for it later. Since there is no bulletproof system and never will be, all systems can and do eventually fail and require modification and adaptation to work in changing conditions. Do you really want to rely on someone else to make these adaptations?